St. John's College proves that classic never goes out of style. St. John's College is built on a great books curriculum, where students study original works in the canon of western thought—there is not a textbook in sight. In 2014, St. John's had pivoted its brand and marketing strategy towards a more universally appealing presentation, and quickly realized they had lost some of what made them distinct. Fastspot was brought in to help them refocus their strategy and ensure a distinctive visual experience lined up with their core identity. We focused our design refresh on bridging the gap between the previous brand and the new one, returning emphasis to the great books and authors at the core of the school's existence. St. John's is not for everyone. It was important for the website to underscore the great books curriculum to appeal to those students for whom reading and discussing timeless texts is enticing. 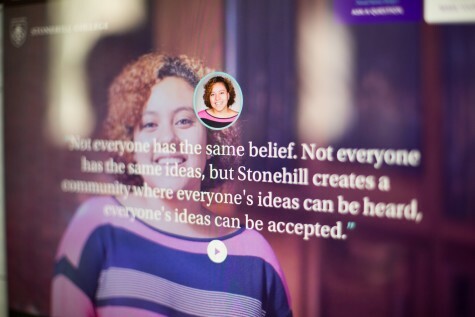 The homepage feature is driven by a content strategy aimed at drawing a direct connection between studying great books and contemporary education and thinking. Student perspectives provide modern relevance and attest to the thoughtfulness of St. John's students. 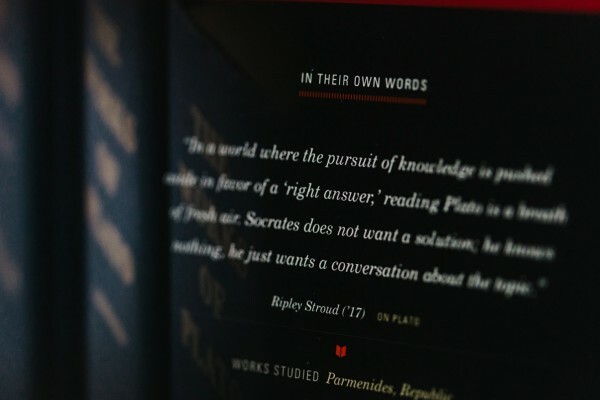 Design elements, like borders and scores, evoke physical books. Layout decisions play off classical concepts of symmetry and beauty. Another unique aspect of St. John’s is that the college has two distinct campuses—one in Annapolis, Maryland, the other in Santa Fe, New Mexico. Applicants apply for one or the other, but may transfer between the two, to continue the curriculum in a different setting. Although the academic offerings are nearly identical between campuses, the student life opportunities available at each could not be more different. Showing the parity/disparity between campuses was a design challenge. 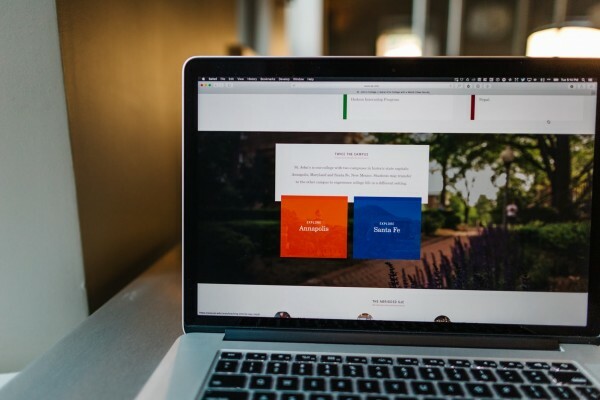 We began tackling it, both on the homepage and on the campus experience landing page, by always presenting both options side-by-side and allowing the distinctive imagery of each location to make a visceral first impression. 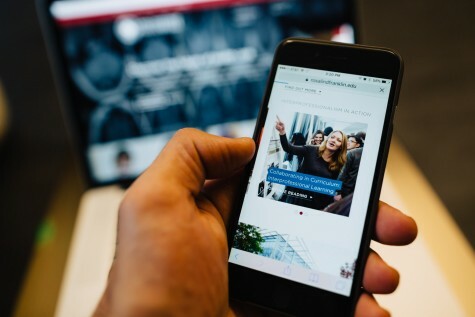 Upon interaction with either campus, prospective students are given a blend of content that speaks directly to the opportunities afforded by that campus. We always strive for authenticity in our work. 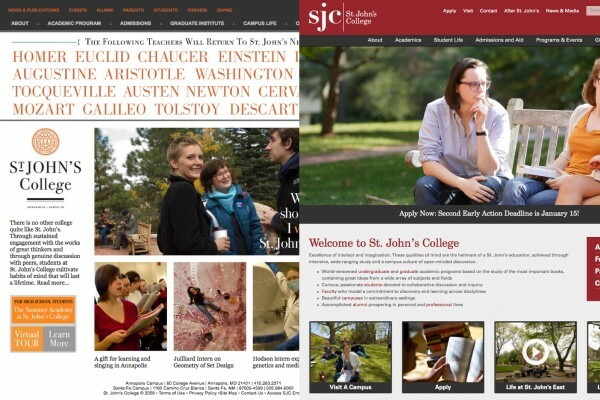 With the refresh for St. John’s, we were able to resurface the school’s unique and authentic character, while maintaining the modern feel of the recent rebranding effort. Classic never goes out of style.